Learn more about the Daily Texts here. Compassion, kindness, generosity of spirit and forgiveness, these are all first nurtured by observing the way Jesus interacted with people, then seeing how people responded to Him. That is God’s grace in action. Its fluidity and beauty isn’t magic, but it surely feels like that when we trust ourselves, God and the very human examples we are privy to in so many of our daily readings, that are also still so relevant in our own relationships. As I watched the events unfold last week in Charlottesville, VA, I experienced a mix of emotions. There was anger, there was fear, there was sadness, and there was heartache. There was anger that people would promote hate and racism. There was fear that this violence would spread. There was sadness for the injuries and loss of life. And there was heartache that we are still fighting the battle against bigotry, hatred, and racism. As Sunday morning came closer I began to wonder how we could address what happened as a community of faith. I did not believe it was something that could be ignored. Two Sundays ago at our church, Ardmore Moravian, we had communion in remembrance of the August 13th revival of the Moravian Church. As these two things sat in my mind, the image of the communion table came into focus. When the Moravians experienced conflict and disagreement 290 years ago, they came together around the communion table. At the communion table there is unity, there is togetherness, and there is peace. At the table, the well-being of all is the utmost priority. We as Moravians hold dear the concept of unity in Christ. And that is why the table is so important: because there is only one communion table. There is not a black table and a white table. There is not a Republican table and a Democratic table. There is not a rich table and a poor table. There is one table, where Christ’s body was broken and blood poured out for all humanity. But unity is not some fluffy concept that sounds really good on a bumper sticker or some unattainable utopian ideal. To truly say we come together in unity despite our differences, is to also say that certain things are not welcome. When we gather at Christ’s table, hate is not welcome. When we break bread and pour wine in remembrance of what God has done, racism is not welcome. Violence and bigotry have no seat at this table. True unity means urgently resisting the ideas of hate, bigotry, and racism. Last Sunday night my wife and I attended a vigil for unity in response to the Charlottesville events. At a park in downtown Winston-Salem, a variety of people gathered. It was organized by local Republican and Democratic groups to inspire unity. At the end of the vigil, we all held up candles to honor those who were harmed and to stand in solidarity together. My wife and I stood there with our Moravian lovefeast candles. A familiar symbol to anyone who has been to a Moravian Christmas lovefeast. It is a candle I have held probably hundreds of times in my life. Although this setting was very different from where I usually have held this candle up before, the meaning behind why we hold that candle up is the same. The flame of that candle proclaims that God is not distant, far away, or absent. It proclaims that God has come to dwell in the midst of our world despite it continued brokenness, violence, and hatred. 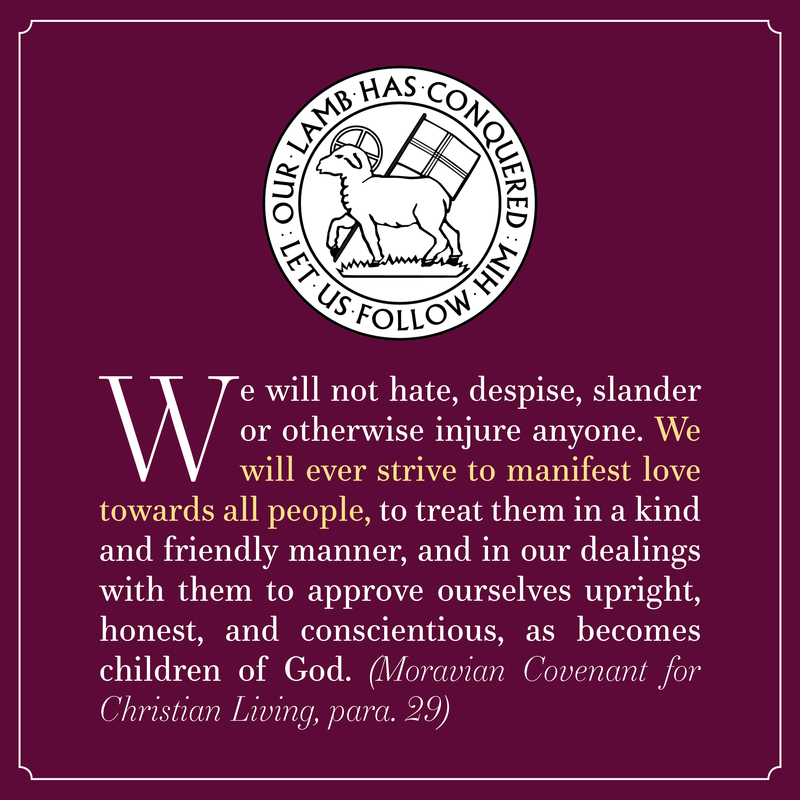 My hope for us as Moravians, is that we can live into our traditions of unity and that those traditions will empower us to resist any forces that wish to promote hate and division. Holding that beeswax candle with its red trimming is a radical statement of love no matter where you are. We write with a deep sense of sadness and concern over the violent and tragic events that happened in Charlottesville, VA last Saturday, August 12. We join in the prayers of people across the United States and our provinces over the deaths of Heather Heyer, and Virginia State Troopers H. Jay Cullen, and Berke M. M. Bates. We also join in gratitude that, in response to a request from the National Council of Churches, at least one Moravian clergy, Sr. Sue Koenig, was present to offer a peaceful, inclusive witness. We condemn in the strongest terms the racism, hatred, and intimidation that were on public display by members of such groups as the Ku Klux Klan, the American Nazi Party, and other white supremacist groups, which erupted in violence, and which resulted in the loss of three lives, the injury of at least 19 others, and untold anxiety and fear among the citizenry of Charlottesville, and the nation. Twenty years ago, both of our Provincial Synods affirmed the following: “The Church must declare that racism is a sin.” Racism contradicts the known will of God expressed in teachings of Jesus that we are to love God and love our neighbor as we love ourselves (Mark 12:29-31). We acknowledge our complicity in perpetuating this sin, both now and in our history. “The Moravian Church, despite sound biblical teaching and clear statements of belief, has, from time to time, demonstrated the values of the surrounding world and thus has denied the very affirmation it professes. It has been affected by the very racism that is contrary to our beliefs. We encourage you to provide opportunities for prayer and conversation among the members of your congregation or fellowship. You may also want to lift up in prayer during worship services what has happened and the vital issues, questions and concerns it raises. We commend our Intercessions in a Time of Crisis (MBW, page 117) as a resource that contains several helpful petitions. 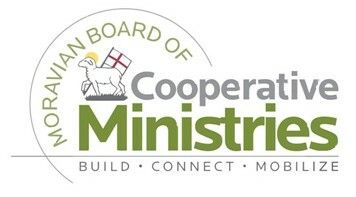 In the coming weeks we will be praying about and reflecting on the specific steps we may take in our Provinces, as congregations, and individuals to truly live into the values we hold and profess, so that we may faithfully “bear public witness” to a world sorely in need of the reconciling love of God revealed in our Lord Jesus Christ. Like most of us who grew up in the church, during my childhood and adolescence my faith was simple and innocent. Untested, and thus undeveloped, might be a better description. I listened to sermons and Sunday School lessons about God, the Bible, and my faith. I thought a lot about what I heard and liked believing in Christ. I confirmed my faith and was glad when I did that. When I left home to attend college, almost everything changed. That included my experience of faith. I still attended church when I stayed on campus for the weekend, and I often attended the daily, evening vespers led by the Baptist Student Union (Wingate is a Baptist school). But these didn’t change my experience of the Christian faith. They pretty much just added to what I was already doing on Sundays back home. But there was one other thing that I started doing that made a dramatic difference in my experience in faith. It not only changed the way I looked at faith. It invigorated it in a major way. It changed my life. This other experience which was new to me and which made such a change in how I lived my faith was interactive gatherings of small groups of Christians where we had the opportunity to talk about our spiritual journeys and the Scriptures. We did this frequently, probably two or three times each week. It was like being at Laurel Ridge Senior High Camp, but for an entire academic year. During the summer I found a similar group back home. In each of these settings, I was engaged in an exploration of what it’s like to live in Christ. I wasn’t just sitting and listening. All of the members of the group found an openness to their questions and to their stories about their spiritual journeys. I found myself growing in my faith. I discovered gifts of service which I used in those small communities. Others in these communities noticed and affirmed these gifts, and I became aware of gifts in others and affirmed these. Over the ensuing years, my conviction has only grown stronger that interactive groups of four or five who gather to share their spiritual journeys are essential to spiritual vitality and growth. The church can’t thrive without them. For decades this need was met through Sunday school classes. They thrived and blossomed. Congregations emerged from them, including several in the Southern Province which were organized in the first half of the 20th century. The Sunday school movement has lost this impact over the past few decades. This isn’t because any shortcomings of this model that served so well for a long time. I think it has more to do with societal changes. Somehow we must find a way to offer opportunities for close, heartfelt interaction about our faith in groups of four or five persons. Peter, James and John were a group of three with which Jesus worked. I suspect that he worked with the others in similar settings. Many of the events in Acts seem to have been informal discussions in groups of only a few. Similar groups were a precursor to the August 13 experience. And similar bands were a foundation stone for John Wesley’s work that became the Methodist Church. This approach to spiritual life and growth is just as necessary now as it was in each of these examples. Have you ever been involved in a group of four or five, or more persons in which you shared your experience of walking with Christ? If so, what impact did–or does–it have on you? If not, did you ever have such an opportunity? and Why didn’t it work out for you to participate? A lot of people agree that we need this but can’t find the time to make it work. Are you one of those persons? What change would be necessary for you to open up time to do this? Do you think you would gain enough through this experience to make the difficult changes in your schedule worth the effort? Read this and move on to something else? Read this and think about it? Read this and do something about it? How can BCM help to make this happen for you? The Rev. 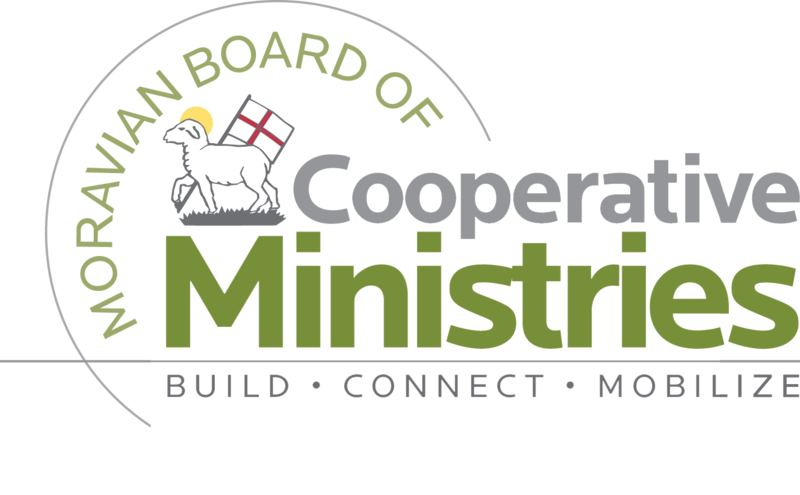 Tim Byerly has worked with the Moravian Board of Cooperative Ministries as a Project Coordinator for the Living Faith Small Group initiative.